These gray/purple hand-enameled earrings feature a Swarovski element stone on the eye and tail. 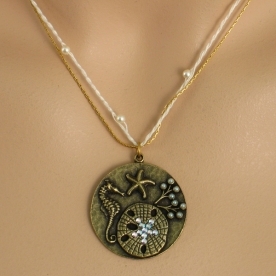 This stylish gold necklace with an exquisite gold and crystal circular pendant with beautiful starfish, sand dollar, and seahorse designs is so unique - it will liven up all of your outfits! Pair it with the matching earrings. Care Info - Keep away from any forms of moisture, perfumes, lotions, or chemicals. Store carefully to avoid tangling and tarnishing.